Star Lit Blades is a non-profit, so any tax deductible donations you would like to give are greatly appreciated! 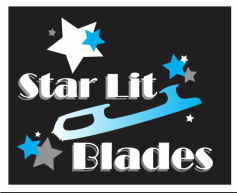 If you are interested in becoming a sponsor please contact us at starlitblades@gmail.com. There are many sponsorship options and levels (sponsor a skater, sponsorship of team items, etc). If you know of anyone who may be interested, please give them our contact information. Every dollar counts in growing the program and keeping costs down! The Star Lit Blades is now listed on AmazonSmile. You shop and Amazon gives back to us! Amazon donates 0.5% of the price of your eligible AmazonSmile purchases to us! AmazonSmile is the same Amazon that you use with the same products, prices, and service. On your first visit to AmazonSmile, just select our charitable organization (Star Lit Blades Synchronized Skating) for our group to receive donation from eligible purchases before your shop. Amazon remembers your selection and then every eligible purchase you make at smile.amazon.com will result in a donation to us. Just click our link to shop and make us your AmazonSmile Non Profit. Follow the link below to go directly to our organization. 3. Enter in all of your information and then go to the "Community Rewards"
4. You can either search for the "Star Lit Blades"
or enter in our group number: "26021"
doing your normal grocery shopping! The Second Annual Star Lit Blades 5K was a success! Thank you for joining us!! Keep your eyes open for more information on our 2019 5K.